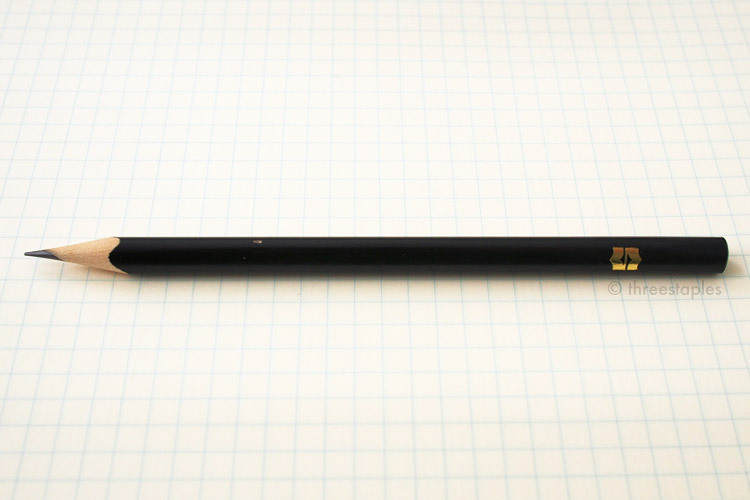 One of my favorite pencils is this simple, black pencil from Shangri-La Hotel in Vancouver, BC. I don’t know if this type of behavior is common among stationery enthusiasts (please say it is) but whenever I stay at hotels, I like to check out the hotel’s stationery, e.g. postcards, letter sets, pens, etc. If they look nice enough, I bring some home as travel momentos. In some cases, I actually send postcards and letters to friends and family. 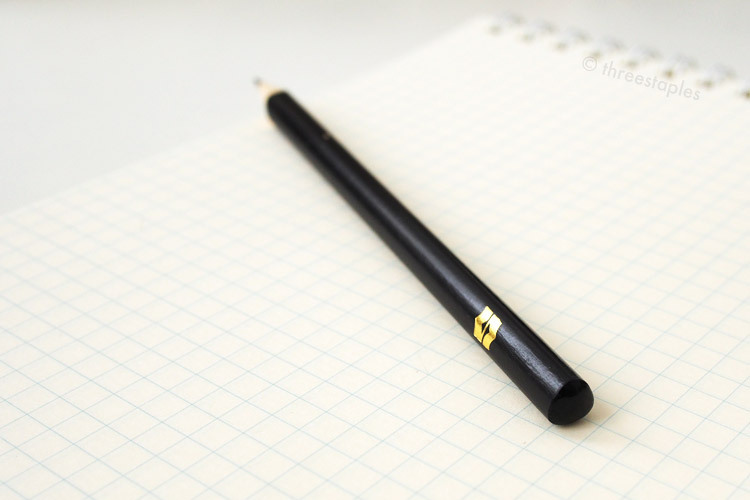 *gasp* I have yet to come across a hotel pen that I’ve liked but I’ve learned that pencils are a different story, and this pencil from Shangri-La taught me to never overlook hotel stationery. Hopefully Shangri-La still gets their pencils from the same source because I find this pencil pretty fantastic (mine is from 2011). Back then, I didn’t think much of it but as soon as I started using it, I instantly regretted bringing home just one. It’s getting shorter and shorter, and it’s making me very sad. One of the main reasons why I like it is that it has a triangular barrel, which I prefer for better grip. It’s minimal in design, with a slightly glossy, black finish. Other than the hotel’s bold, gold “S” logo, there is no other printed information. I’m guessing the softness of the lead is comparable to a Japanese HB or B. It may not look like it but the core is well centered; I blame my sharpener for not doing its job evenly. As for the wood, I’m not sure what type it is, but it’s lighter in color than most pencils I’ve encountered. And no eraser! I take no issue with that, as I’ve explained in my first pencil post. The lead feels softer and darker than I’d initially expected. It writes smoothly with consistent opacity. This is my first detailed pencil post, so I’m still not familiar with the most descriptive, appropriate terms but the core feels soft without feeling too “gritty” or giving off graphite “dusts.” Perhaps “slightly waxy” is a better description. And did I mention the triangular barrel? If you couldn’t tell by now, I’m pretty attached to this pencil, partly because it was from a trip and partly because it exceeded my expectations. Well, the fact that it was complimentary doesn’t hurt either… Wait, these ARE complimentary, right?? I’m assuming a single pencil isn’t enough to convince you to stay at a particular hotel. But if you happen to stay at a Shangri-La Hotel, do check out their pencil and let me know how you like it! Hopefully they haven’t changed anything and use the same type across all their locations. I remember the Vancouver Shangri-La was quite pleasant; I had no complaints. I’m not sure if I’ll ever be able to stay there again (M and I were able to stay there with a special grand-opening discount) but I’ll always think of it as that nice hotel with nice pencils. Heh. Woah, Jinnie pretends to be a legit pencil reviewer! *cough* The notepad is LIFE Stenographers' notebook, with pale yellow pages and blue graph grid. Do you ever take hotel stationery home? Have you found any hotel pens or pencils you like? PS: Speaking of Vancouver, check out Josh Ginter’s series of posts on his recent trip to Vancouver. His photos are great, and it's always interesting to read how other people travel. Katherine at Feather Factor also has a nice post on Vancouver here. I’ve been to Vancouver a few times and love it as well. Just for its ramen scene and Paper-Ya, I would visit again.